Tilling prepares fields for crop plant seeding, with the goal of creating optimal conditions for crop growth. But unfortunately, plows and the plowing process can have untoward effects such as soil erosion and compaction. Using machinery to till cropland optimizes crop growth conditions and soil fertility, and preserves and maximizes soil yield capacity. Today’s intensive crop cultivation practices, as well as technical advances, entail the use of highly specialized, powerful and heavy machinery, equipment and transport vehicles that weigh up to 60 tons. There are basically two types of tilling: primary tilling and secondary tilling. In primary tilling, the upper 30 centimetres of the soil are ploughed and turned over, whereby weeds and plant residues are worked into the soil and fertilizer is spread on the topsoil. 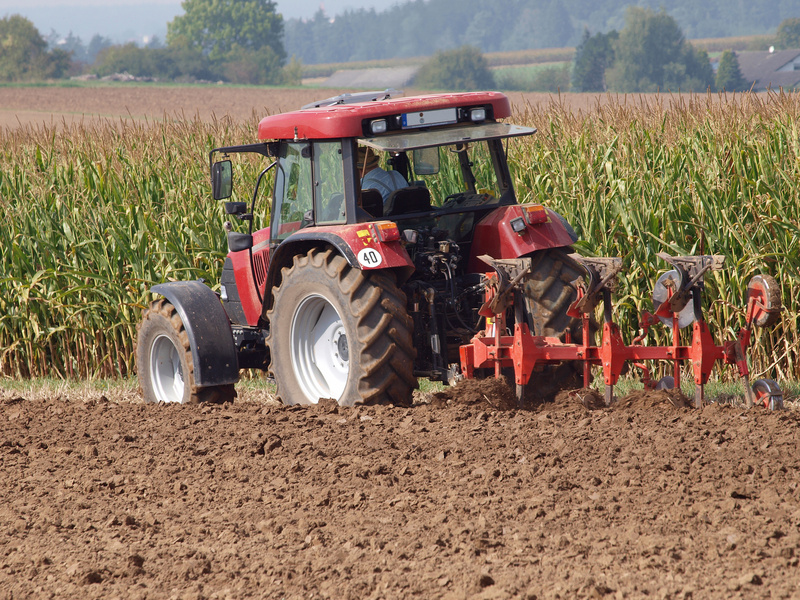 Secondary tilling involves further working of the topsoil (the upper 10 centimetres of the soil), the goal being to create a shallow seedbed for the crop plants. Repeatedly driving heavy machinery over fragile farmland, as well as the tilling process itself, has (a) a direct impact on the soil structure and on soil organism habitat conditions; and (b) an indirect impact on soil susceptibility to erosion, nutrient discharge, and reduced soil fertility. Hence fields should be tilled and used in a manner that protects the soil and that is commensurate with local conditions, so as to avoid deleterious effects and at the same time cultivate crops in a manner that is sustainable, productive and environmentally sound. Ideally, farmers till the soil in order to create a physically favourable topsoil structure that allows for unimpeded transition to the subsoil, the goal being to optimize the water balance, adapt phytoavailability to crop plant needs, and work plant residues and fertilizer into the soil. At the same time, weed and pathogen pressure must be mechanically regulated and (insofar as possible) minimized. In reality, however, these goals are often undermined by mechanized plowing, due to the changes wrought by it in the soil structure. Plowing involves turning and loosening of the topsoil (the upper 30 centimetres of the soil), a process that has both an upside and a downside. The upside is that the soil is well aerated and promotes root penetration; plus the surface of the field is free of residues and vegetation. These conditions are essential for trouble-free seeding. But the downside is that plowing tends to compact the soil, particularly in cases where heavy machinery is frequently driven over wet fields. Soil compaction can reduce the very soil fertility that mechanical plowing is intended to optimize. A situation where soil is unable to perform its natural functions is referred to as deleterious soil change – a condition whose elimination is extremely cost intensive. The amount of farmland affected by soil compaction is difficult to determine, with estimates ranging from ten to 20 per cent. This mainly applies to ground that is frequently driven over by heavy machinery and that has unfavourable moisture conditions. The current status of the soil structure of around half of Germany’s farmland is such that further compaction could potentially result in irreversible soil-quality degradation. This conclusion was reached using a UBA study’s criteria for the assessment of soil structure characteristics. Compacted soil reduces crop revenue and increases the risk of soil loss and erosion, particularly for ploughed, fallow farmland that is devoid of vegetation in hilly terrain. During heavy rains, precipitation strikes the surface of the ground unimpeded. As a result, fine soil particles are mobilized that can clog soil pore systems, and a layer of sludge builds up that further impedes rainwater infiltration. The rainwater flows on the surface instead, picking up soil particles and the nutrients and pollutants therein; this, too, reduces soil fertility. The deposition of soil particles and nutrients in nearby lakes can cause eutrophication. Hence the consequences and processes entailed by unsuitable tilling methods reinforce each other. Around 15 per cent of Germany’s farmland is severely threatened by erosion, while an additional 35 per cent is threatened by long-term fertility loss. Hence it is absolutely essential that farmland be used judiciously and in a manner that is compatible with local conditions. Harmonized soil fertility conservation methods and methods that reduce the susceptibility of soil to erosion and compaction are needed; they are eligible for regional-state, federal and EU funding. One of the most effective ways to protect farmland is through a method known as conservation tillage, which avoids the use of ploughs in favour of tilling apparatuses such as cultivators and disc harrows that largely leave the natural structure of the soil intact and promote a stable soil structure that can support loads and that is far less prone to sludge formation. The erosion-reducing effects of conservation tillage are strengthened by the fact that plant residues remain on or near the surface of the ground, rather than being worked into it. These residues mitigate the destructive force of heavy rains, preserve soil fertility, and help to prevent erosion. However, it should also be noted that conservation tilling often requires farmers to use more pesticides than would otherwise be the case, due to the fact that harvest residues remain on the ground and weeds are not plowed under. The Federal Soil Conservation Act (BBodSchG) and agricultural cross-compliance regulations mandate requirements and measures concerning the protection of soil against the potential negative effects of tilling. They also promote the use of conservation tilling methods, as part of the second pillar of the Common Agricultural Policy (CAC), in the guise of what are known as agri-environmental measures. The code of good agricultural practice (pursuant to paragraph 17 of the Federal Soil Conservation Act (BBodSchG)) aims to enshrine the precautionary principle in the soil conservation arena and prevent the status of Germany’s farmland from worsening. The measures and techniques entailed by this code take their cue from the state of the art and recognized scientific findings. The code also lays down the following principles (among others) for good agricultural practice to ensure sustainable farmland fertility and productivity: (1) Tilling should be carried out in a fashion that is compatible with local conditions, that takes weather conditions into account, and that conserves or improves the soil structure. (2) Soil compaction should be avoided wherever possible, by taking ground type and moisture into account, as well as by avoiding the use of farm equipment that exerts pressure on the soil. (3) Soil loss should be avoided wherever possible, through farming methods that are compatible with local conditions, and in particular by taking into account terrain slopes, water and wind conditions, and ground covering. (4) Characteristic local humus content should be preserved through adequate input of organic substances or by reducing tilling intensity. The regional states enforce the Federal Soil Conservation Act (BBodSchG) through lower level soil conservation authorities in consultation with the competent agricultural authorities. In view of the special status of Germany’s agricultural sector, normally these authorities only intervene in an emergency. However, the precautionary principle (pursuant to paragraph 17 of the Act) does not empower these authorities to enforce implementation. Funding has proven to be one of the most effective instruments when it comes to implementing targeted measures under the Act. Such funding (which is currently optional) is effected via cross-compliance direct payments – which, however, only allow minimum standards to be met that fall short of the requirements laid down in section 17 of the Federal Soil Conservation Act (BBodSchG). Farmers wishing to obtain Common Agricultural Policy subsidies are required to meet cross-compliance requirements (as enacted in 2003), pursuant to Regulation No 73/2009/EC. Cross compliance also entails compliance with what are known as “statutory management requirements” and maintenance of the “good agricultural and ecological status” of farmland. The statutory management requirements comprise 18 applicable European directives and regulations and their transposition into Germany’s environmental, animal welfare and public health laws. Compliance with these laws is normally verified via random sample testing, and infringements can result in funding cutbacks. The legal framework for these measures in Germany is the Direktzahlungen-Verpflichtungsgesetz and the related regulations. The rules governing the preservation of “good agricultural and ecological status” for farmland comprise eight mandatory measures and a lesser number of voluntary measures, including compliance with minimum requirements aimed at achieving goals such as soil erosion reduction, preserving soil structure and humus content through suitable measures, and maintenance of set-aside areas. In 2010, funding eligibility requirements for farmland threatened by erosion were tightened. Now, in order to qualify for funding, farmers are required to (a) classify their fields according to proneness to wind and water erosion; (b) implement the erosion reduction measures prescribed by law. In addition, tillage on land that is prone to water and wind erosion is prohibited or restricted during certain periods. And while farther reaching measures such as mulch sowing and steep stratification tilling are not required, they achieve a higher level of protection and are regarded as a general standard. German regulations currently do not call for measures aimed at preventing soil compaction associated with fertilizer use. The second pillar of the Common Agricultural Policy (CAP) calls for the fostering of agri-environmental measures that will enable farmers to bring about ecological benefits exceeding the minimum requirements. Such measures include the use of soil conserving cultivation and production methods such as conservation tilling, mulch sowing, direct sowing, and catch cropping.